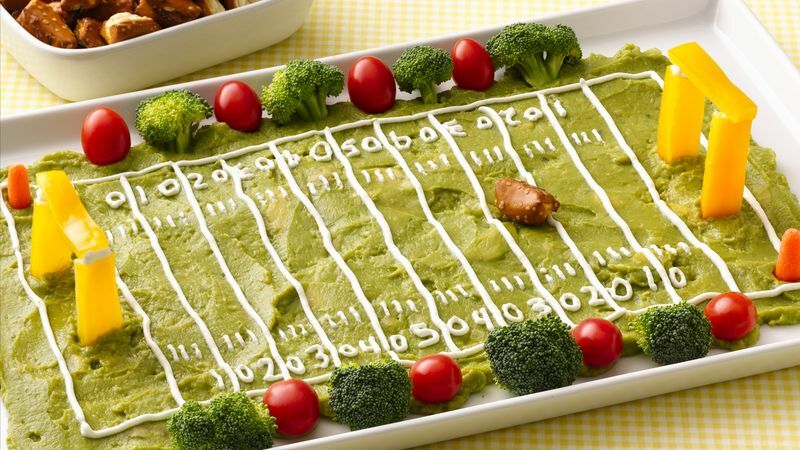 To assemble football field: Spread guacamole evenly onto rectangular serving platter. Spoon sour cream into decorating bag fitted with writing tip. Pipe goal lines, numbers and borders onto guacamole. Cut 6 (1 3/4x1/2-inch) strips from bell pepper. Place 2 strips on each side of field for goal posts. Pipe small amount of sour cream on each bottom corner of remaining 2 bell pepper strips; place on tops of goal posts. Cut carrot in half for safety cones; place on one side of each goal post. Place 1 pretzel nugget on each end of the field. Arrange broccoli florets and tomatoes along side lines for people. Serve with additional vegetables and pretzel nuggets. Create your own personalized football field using your favorite vegetables. Serve extra veggies on the side.